All about the computers and consoles that power our gaming dreams. For many of us these machines hold a special place in our hearts. More than just plastic and circuits, more than fun and games, more even than the great ingenuity and dedication it took to make them, these machine represent eras in our lives like certain songs do. I remember the winter holiday I spent painstakingly programming a Breakout clone on the family’s ZX Spectrum. The summer I discovered alcohol and rock gigs is equally remembered as the summer of massive multiplayer sessions with my friend on Micro Machines Turbo Tournament on the Sega Genesis. The year following my graduation was the year my Dreamcast prevented me from being bothered to look for a proper job. 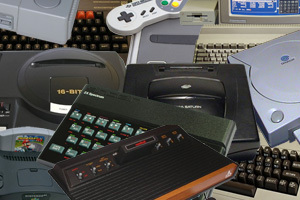 In this section we take the time to look back at these machines in an attempt to understand how they came into our lives and gave us such memories. How would you like to browse the machines?